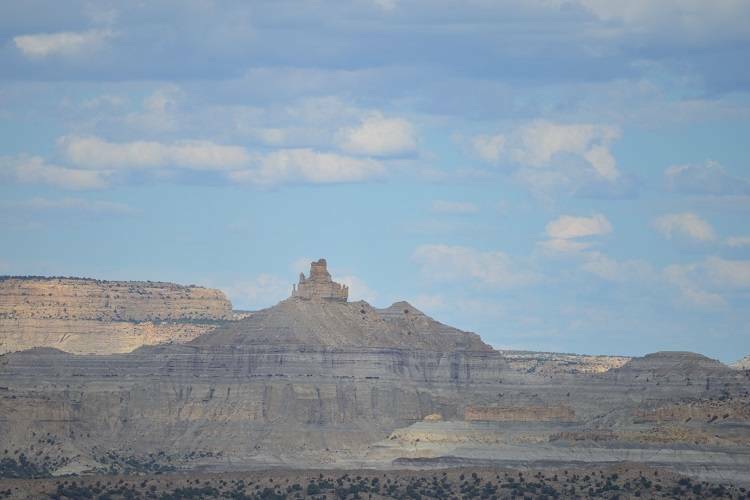 The Sage, Castle Rock, and Cliffs picnic areas contain seven developed sites and are located along the rim road. Each site has a shelter, tables on a concrete underfoot, a gravel pathway, and a fire grate. Trash cans are located in all three picnic areas. Accessible vault toilets are available at both Sage and Cliffs picnic areas. The Angel Peak Campground has nine sites available for tent camping; each with picnic tables on a concrete underfoot, gravel pathways, and fire grates. Picnic shelters are located at three campsites; two with single shelters and one with a double shelter suitable for larger groups. Two accessible vault toilets and trash receptacles are conveniently located in the campground. Access Angel Peak Scenic Area from US Highway 550, 15 miles south of Bloomfield, by traveling east on County Road 7175. Follow the gravel road along the canyon rim for approximately six miles to reach the campground. You will pass three developed picnic areas along the way. It is important to note the gravel road may become impassible in bad weather. No electrical hookups or water is available. The area is subject to seasonal extremes and visitors should be prepared for changing weather. All motorized vehicles and mountain bikes are required to stay on maintained roads. Trees in the area are scarce and firewood gathering is prohibited. Please bring your own wood if you plan on having a fire. Collection of vertebrate fossils is prohibited except for scientific studies under permit by the BLM. Permits are required for commercial, competitive and organized group events.